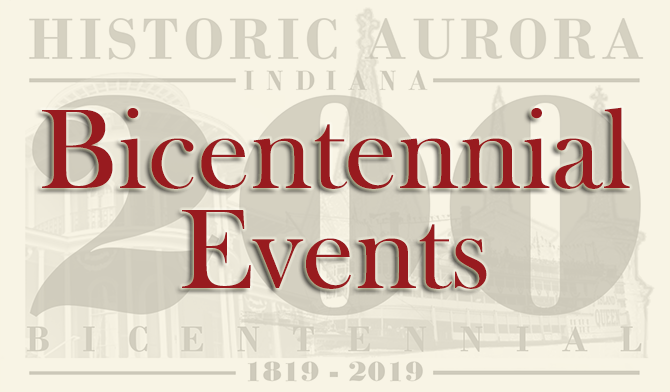 Saturday, April 13 – “Happy 200th Birthday” Main Street Aurora Dancing on Main - (over 21 event) $5.00, 7-10:30pm, 228 Second St. Dinner available, $7.00. Info: 812-926-1100. September 13, 14, 15 & 16 – LST - (Landing Ship Tank) on display on the riverfront in Aurora. Landing Ship Tanks were designed during WWII to transport and deploy troops, vehicles, and supplies onto foreign shores, without the use of dock facilities. The ships proved to be among the most successful in the history of the U.S. Navy. Open 9am-6pm daily. Small fee to board the ship for a tour. Large display of military equipment on land. October 2-5 – 111th Aurora Farmers Fair - The Farmer’s Fair began as an agricultural show in 1908. Today the Fair has 4 stages throughout the town with live music, an exhibit hall at the Lion’s Club Building, rides, food, a King & Queen contest and a huge street parade on Saturday morning. 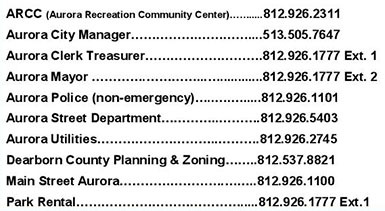 Saturday, October 19 – Historic Downtown Aurora Tour - 10:00am - 3:00pm. Sponsored by Indiana Landmarks.